It’s already reimen season in Japan. I remember that it was this time of the year when I posted about the cold, refreshing noodle dish last year. Though it is not a traditional Japanese dish, reimen is a staple of summer over here these days, and I’m very grateful for the person who invented this dish. Because it was so incredibly hot and humid, I made reimen for lunch today. 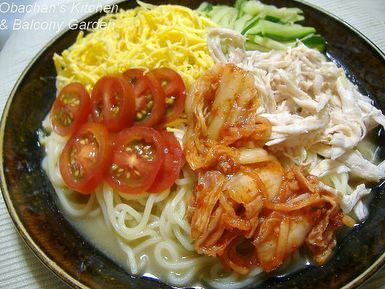 I used the same reimen kit as in this post, which included noodles, ready-made soup and mustard in a package. The toppings were a little different this time, though. Yes, I prepared the egg differently, and added kimchi for a spicy kick. I wouldn't mind eating your reimen for dinner as here it is soooo hot and quite humid!!! Wow! That looks like a nice summer's meal. I agree. I’ve tried a couple of not-so-good ones, too, and I didn’t like the cheap ham they had as a topping. You know, those cheap, red ones that smell like chemical. Yep, it is. :) Too bad I don’t have a nice glass bowl now so had to use this thick, heavy plate, but when served in a big glass bowl, it looks soooo refreshing! Oh I wish I could have this right now... looks yummy indeed. We only gave instant ramen where we live, but we do have some nice soba. Would kimchi soba taste good?